Hello Piso Fare friends! The Air Asia Red Hot Sale is back! Avail tickets as low as P16 for select domestic trips. The Air Asia promos include tickets as low as P16 ALL-In one-way fare for the routes Clark to Kalibo. Air Asia promo tickets on few routes cost only P216 for one-way travel. Read this post for other exciting Air Asia seat sale including international promos to select foreign routes for only P1,290 per way. Air Asia promo ticket rates are exclusive of Domestic Passenger Service Charge, Web Admin Fee/Booking Processing Fee and Country Specific Charges/taxes. Promo tickets are great for trips from May 7, 2018 until January 31, 2019. This means you can avail cheap tickets for your summer vacation 2018 and Christmas holidays 2018. For non Big members, booking for the red-hot sale tickets begins on November 13, 2017 at 12AM. However, BIG members has priority booking starting November 12, 2017, 12 midnight. Promo fare tickets can be booked until November 19 or until seats are available. As of 3PM today, the Air Asia red hot sale tickets are almost all taken. However, some promo fares are still available. How to Avail the Air Asia Red Hot Sale Tickets? Get the Air Asia promo ticket by booking online at www.airasia.com starting November 13, 2017. Promo tickets are limited and may not be available on all flights. Payment Centers- Bayad Center, EC Pay, 7 Eleven, SM Store, Robinsons Store, Cebuana Lhuillier and M Lhuiller. 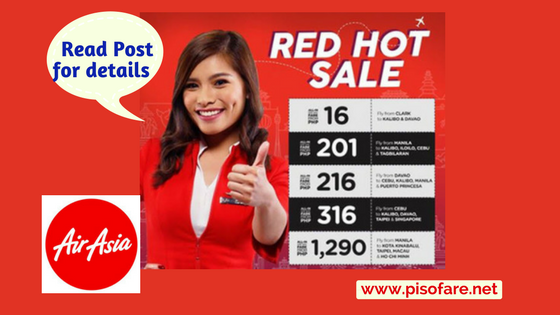 Check for updates on the Air Asia Red Hot promo and other airline seat sale here in our Facebook: PISO FARE TICKET! Like us in Facebook to get notifications in your newsfeed! Available p po ba itong promo?